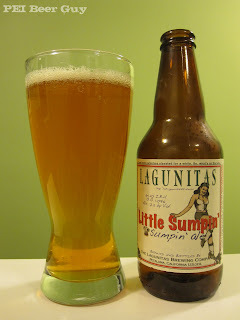 This ale is a little paler than other Lagunitas beers I have had. It is a slightly cloudy yellow with an orange tint. There is very little head. Before I even start to drink it, there is just a film of some creamy bubbles left. There is a nice, hoppy smell to it; peach orange, and a bit of pineapple. A bit of yeast and dough. There is something creamy about the flavour... almost like a peach yogurt quality, or something close to a saison / farmhouse ale or, perhaps, a Belgian white ale / triple. I also wonder if I'm picking up a bit of banana and spice in it. The finish is slightly bitter and sticky. The body is on the lighter side of medium. The carbonation is good. The tingle of it lingers at the back of the throat. It also feels a bit like some saisons or hefeweizens I have had. Overall? Good. It pales a bit in comparison to some of Lagunitas' other similar offerings, though.